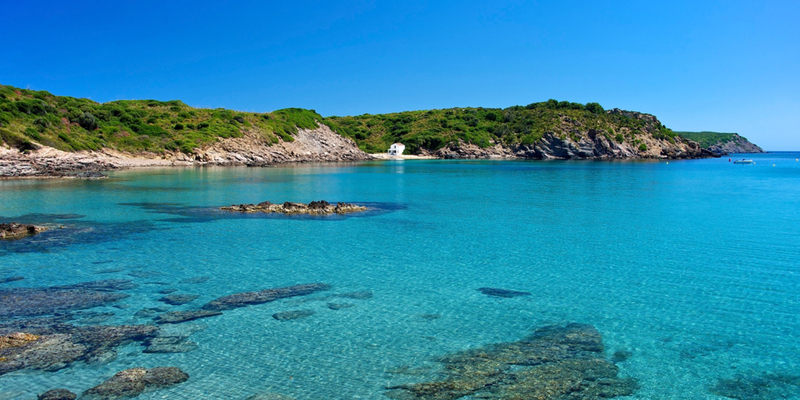 Menorca enjoys a typically Mediterranean climate, warm dry summers, and winters which are cool and humid. The average annual temperature of the island is 18,11˚C, with a minimum annual average of 13,90˚C and a maximum annual average of 22,33˚C. The average annual rainfall in Menorca is 650 mm, which varies from one year to the next depending on the area. The island enjoys around 300 days of sun a year. Menorca is the most northerly of the Balearic Isles, so its climate is a little cooler and more humid than its counterparts in the South. However, the most characteristic element is the wind. As it lacks any protection from mountains, Menorca receives in full the air flowing in from the north. Hence, the island of Menorca is known as "the island of the winds". Menorca has the first wind farm in the Balearic archipelago. The summer is the best season to visit the island, but be sure to make reservations and plan your holiday well in advance as the months of July and August are the most popular, and therefore the busiest. If, on the other hand, you wish to experience the purest essence of Menorca, the months of May, June and September are highly recommended since they offer fantastic climate and the landscape and beaches are especially beautiful. In particular, during the months of June and September the patron saint's fiestas of the two most important towns in Menorca are celebrated: the fiestas of Sant Joan, in Ciutadella and the fiestas of Mare de Déu de Gràcia, in Maó. Events which year after year draw people from all around the world.